During most of the previous century, soldiers were looked after in the military hospital, a neoclassical monument situated amid Antwerp’s 19th-century sprawl. This beautiful complex has now been restored and redeveloped into a serene urban haven. Contained within the original complex was a convent, whose diverse typology of buildings served as home to the nuns who looked after the soldiers, a place in which they could withdraw from the demanding task of assisting the ill and wounded. The front building housed a reception area for visitors and guests, while a more elaborate, centrally located chapel facilitated worship. 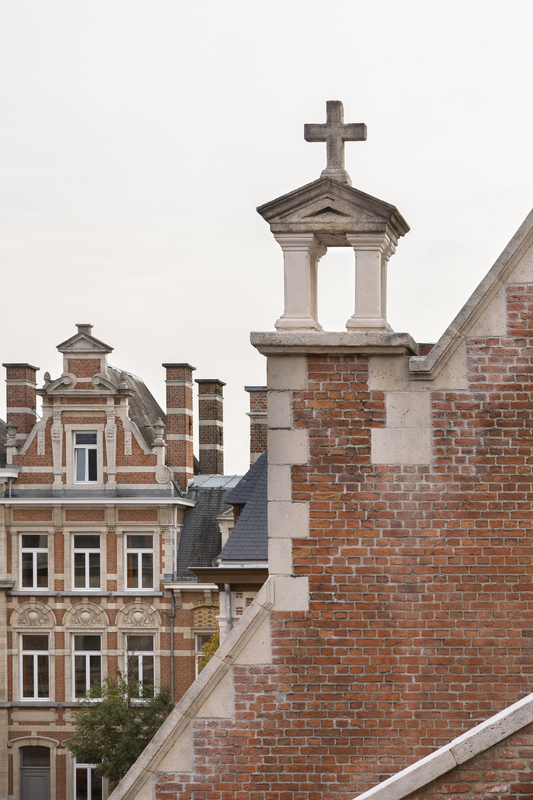 The main residential building and its gardens are slightly separated from the others – in fact, most passers-by hadn’t even noticed that this part of the hospital existed; yet, by way of its function, it forms an inseparable part of the magnificent monument. Vincent Van Duysen Architects’ strategy in turning the hidden gem and its gardens into AUGust was first and foremost to respect the historical DNA of the site and its surroundings and to align with the general principles governing the redevelopment of listed buildings. 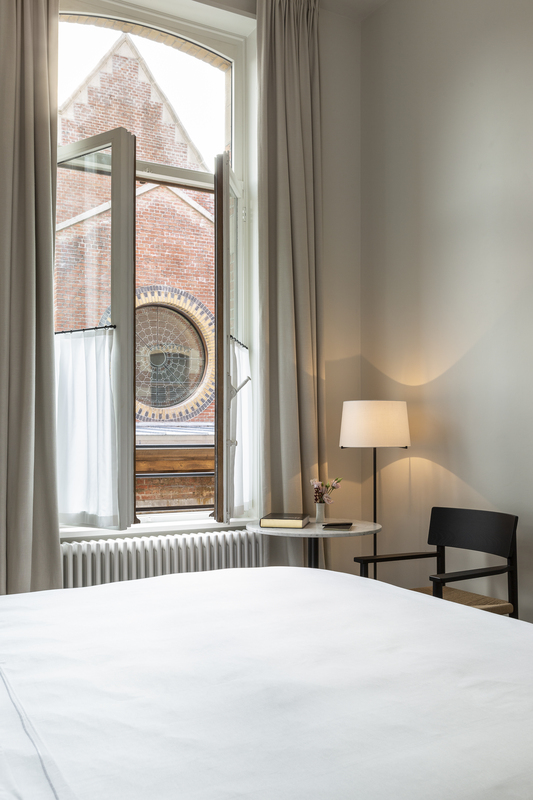 This was achieved through the careful restoration of its neoclassical splendour (in collaboration with Wouter Callebaut Architecten), and through the addition of contemporary architectural elements, suitably upgrading the premises to its new function as a modern hotel. The project consists of three gardens and five public buildings, all in the neoclassical spirit. One can still sense the sober, understated life of the convent nuns. The chapel and public entrance are much more elaborate than the rest, in keeping with their important purpose. Utilising new technology – well known in the shipyards of Antwerp’s harbour – the military performed tests on the contemporary steel structure that complements the master plan of brick buildings. All design decisions have been guided by a respect for the existing architecture, with the wilful intent not to let the necessary structural works create any visual impediments. Black awnings hover above AUGust’s main entrance and, along with a newly planted tree, serve to ‘identify’ the project – this is what guests will first encounter. These refer to the glass awnings covering the former terraces of the hospital pavilions, while also functioning to beckon visitors. Like the Art Deco canopies in neighbouring Cogels-Osylei, the entrance signifies a new urban entity in Antwerp: AUGust. The interior scheme nourishes the existing features, highlighting the grey-green timber panelling, the white mouldings, and so forth, reintegrating original elements and reproducing others that have been damaged or diminished, while selectively introducing black components to distinguish the contemporary from the classic. This design approach has been consciously applied throughout the project, reviving the classical feel for a new public. Nestled in the winter garden is the restaurant, whose glass roof emphasises its central function within the complex. Carefully restored decorative profiles and doors, along with hand-painted tiles and white marble, as seen in the chapel, are the undisputed protagonists in these internal spaces, where again, black elements represent the new, providing contrast and gently bringing contemporary life to the project. Respecting 19th-century traditions, the fixtures and fittings are tailor made, with lighting by Flos and furniture by Vincent Van Duysen for Molteni, each and all of which have been specially developed. AUGust, which now cares for another kind of guest, invites visitors to gather at the bar inside the former chapel and to partake in its various offerings, such as savouring a fine meal in the sunlit restaurant, experiencing the maze of gardens, and spending the night in one of its 44 guest rooms. While these activities are not dissimilar to those of convent life, the difference lies in the shift from private seclusion to public access, and in the possibility of overnight stays. The aim is for hotel guests to feel completely welcome and at ease in a pleasant, hospitable environment; to derive the same kind of joy the former residents felt in worshipping God. Interwoven amongst the architecture are the gardens, expertly designed by Martin Wirtz. These are lush in atmosphere, providing a veritable oasis of greenery in which visitors can immerse themselves. A diversity of trees ensures continuity throughout, while detailed differences denote the individuality of each. The main walled-garden is organically structured, with irregular volumes of clipped hedges, shrubs, trees, and perennials. Flowers are in bloom most of the year, and zones have been created to lend a sense of place and enhance cosiness. The unusual plant beds extend into the garden surrounding the grotto, where they transform into traditional flowerbed arrangements, instilling a more intimate character. A secluded jardin secret defines the third garden. It contains a natural swimming pond around which a row of crisply clipped evergreen oaks is clustered, allowing AUGust Spa users total privacy. These green characteristics add the aspect of outdoor life to the comfortable and warm world within, imparting balance and completing the composition.